"The time that he can get away with lying to the American people all the time and evading accountability is coming to an end," Rep. Nadler said. 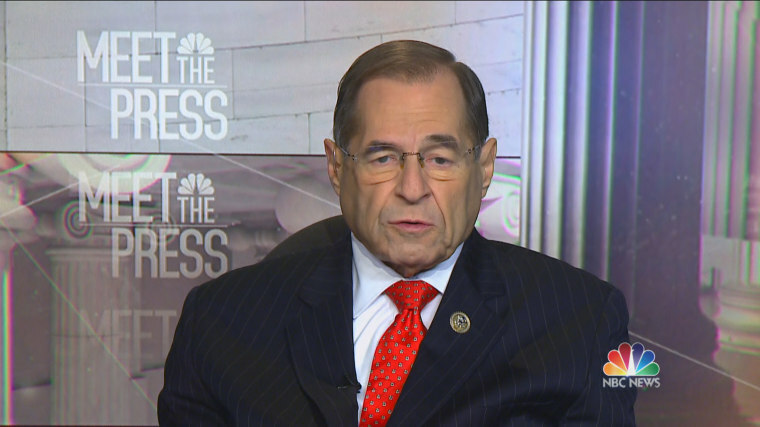 WASHINGTON — New York Democrat Jerry Nadler, the incoming chairman of the House Judiciary Committee, said Sunday that new revelations from one of President Trump’s allies amount to proof that Russia had "leverage" over Trump during the 2016 presidential campaign. In an exclusive interview on "Meet the Press," Nadler said that former Trump lawyer Michael Cohen’s admissions last week related to his role in securing a Trump Tower in Moscow during the time of the GOP presidential primary raise the specter of a compromised presidential candidate, and now president, that should trouble the American people. "The fact that he was lying to the American people about doing business in Russia and the Kremlin knew he was lying gave the Kremlin a hold over him," Nadler said. "One question we have now is, does the Kremlin still have a hold over him because of other lies that they know about?" Nadler’s comments come days after Cohen pleaded guilty to lying to Congress about his role in the Trump Organization’s business dealings with Russia around the time of the presidential campaign. As part of the plea deal, he promised to cooperate with special counsel Robert Mueller’s investigation into whether Trump’s campaign or allies colluded with Russians during the election. The president's former lawyer told the court he erred when he said the project was scuttled in January of 2016, since he continued work on the project until June 2016. And he said he lied when he told Congress he never traveled to Russia in connection to the project and when he said he had never spoken to a Russian official about it. The revelations are the latest warning sign for Trump about the special counsel's investigation into any possible collusion between his presidential campaign in Russia. Also this week, NBC News reported on court documents that show a former Trump adviser received an email from an ally referencing a possible document dump shortly before WikiLeaks began to release leaked emails form Democrats. Trump, who had previously claimed he has "nothing to do with Russia," told reporters on Thursday that Cohen is lying so prosecutors are lenient when sentencing him. And he downplayed the prospect of his company negotiating a possible Russian tower during his presidential bid by arguing that it was "a project that everybody knew about." During the Sunday interview, Nadler argued that the business connections could help explain why Trump has spoken so highly of Russian President Vladimir Putin, dating back to his presidential campaign. And he warned the president that a Democratic Congress will step up congressional oversight come January. "We have a president who lies incessantly to the American people about big matters and small matters, who surrounds himself with people who lie incessantly to the American people. The key fact now is that the time that he can get away with lying to the American people all the time and evading accountability is coming to an end," he said. Wyoming Republican Sen. John Barrasso, the newly-minted No. 3 Republican in the Senate, downplayed Cohen's guilty plea in a "Meet the Press" interview Sunday. "The president is an international businessman, I’m not surprised he was doing international business. Cohen is in trouble for lying to Congress, not anything related to the campaign or Russian influence," Barrasso said. When asked whether he’s concerned that the Republican primary electorate didn’t know about the negotiations with Russia when they chose Trump to be the party’s nominee, Barrasso said that Trump has delivered on his electoral promise to Americans. "People were thinking it was time for a change, they didn’t want Hillary Clinton, they wanted a new opportunity and they’ve gotten it in terms of a strong and healthy and growing economy," he said, before arguing that the Mueller probe should end so the American people can "see what’s in it." Barrasso brushed aside calls to pass legislation to protect Mueller from a possible indiscriminate firing by Trump, while criticizing some murmurs among Democrats that the government shouldn’t be funded without that assurance. "They’ve been crying wolf for two years that Mueller was going to be fired. Didn’t happen, not going to happen," he said, adding that suggestions about holding up government funding over the issue is the "wrong way to go."